Dementia is the result of damage to the brain which gradually affects memory and the ability to communicate and to carry out the functions of daily living. People with Dementia gradually lose the capacity do the normal activities of daily living, such as paying bills, cooking a simple meal, planning a trip, and keeping themselves neat and clean. As time passes even walking and swallowing are affected. Nearly 4.2 million elderly Indians suffer from dementia due to Alzheimer's or other diseases. As awareness is low, many are not diagnosed for years, and their symptoms such as forgetting, making mistakes and inability to do normal tasks, are considered a part of normal ageing. Early diagnosis and management can help on the rough road that dementia patients and their families have to travel. Dementia is a group of symptoms. In the elderly above 65 years, Alzheimer’s Disease is the biggest cause of progressive dementia. A "progressive" dementia is one that cannot be cured. There are over a 100 diseases which cause dementia, including vascular dementia, fronto-temporal, and Lewy body disease. 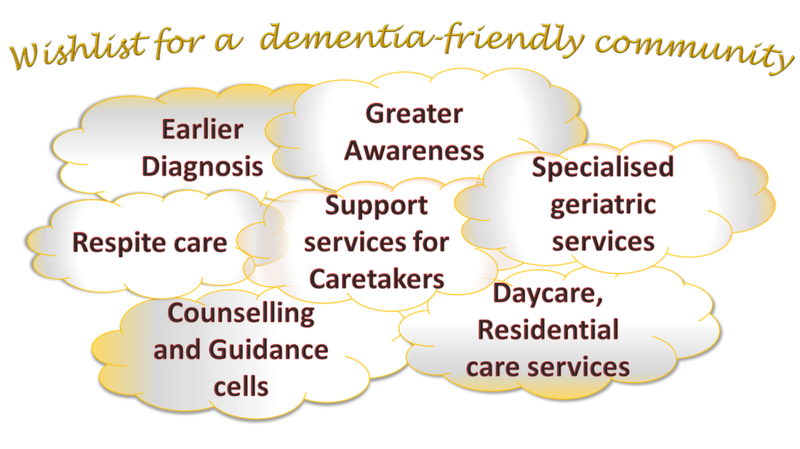 Dementia is a great burden for the persons who have it and their caregivers and families. The cost to society was estimated to be Rs.14,700 crore in 2010 by ARDSI, and it is forecasted to double by 2030. The emotional cost of dementia is immense, caregiver stress is extremely high.